Signing the collaboration agreement are (L-R) QBO Innovation Hub Head Rene Meily, IdeaSpace Chairman of the Board Manuel V. Pangilinan, DTI Secretary Ramon Lopez, and DTI Export Marketing Bureau Director Senen Perlada. The Department of Trade and Industry (DTI) through its Export Marketing Bureau (EMB) and IdeaSpace Foundation (IdeaSpace), the leading early stage technology incubator and accelerator in the Philippines, today signed a memorandum of understanding for the establishment and launch of the QBO Innovation Hub at the DTI International Building, Sen. Gil J. Puyat Avenue, Makati City for startups and innovation entrepreneurs on August 8, 2016. The Hub aims to link innovators, explorers, investors, academic institutions, start-up mentors, funders and enablers as well as a broad spectrum of partners and stakeholders from both public and private sectors to convene in constructive interaction and is DTI’s support to the startup community, particularly targeting startups with viable business propositions. “We hope to open more opportunities for market access and capital, and mentorship for our startups, especially the growing number of young entrepreneurs,” added Perlada. The QBO Innovation Hub is under the Negosyo Center Plus operating model although it will be more selective and focus on more mature startups. As a flagship initiative of DTI to encourage entrepreneurship in the country, the over 250 Negosyo Centers across the country are equipped with materials and resource supports that will assist entrepreneurs and would-be entrepreneurs. 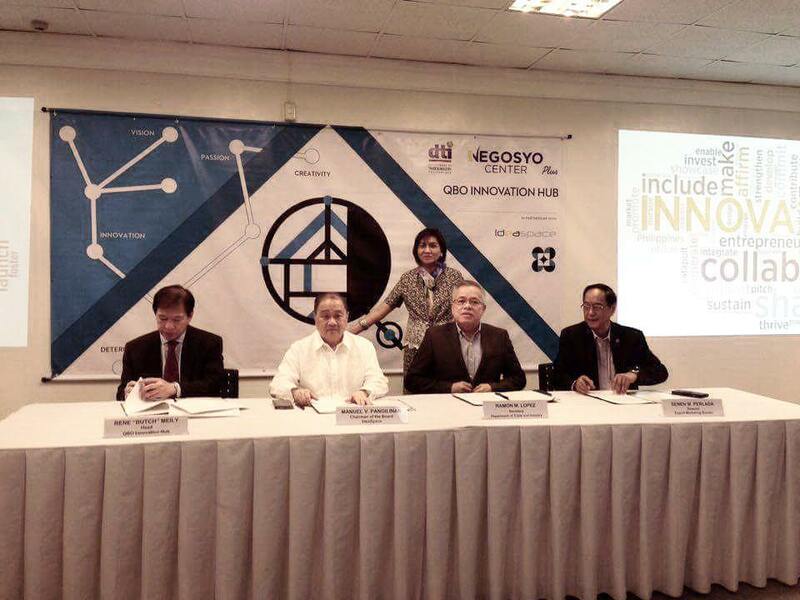 As the agency adds more services catering to the needs of the startup community, more centers under the Negosyo Center Plus model will start assisting those in the startup and innovation sector. “As a strong supporter of the startup ecosystem in this country since we launched IdeaSpace a few years back, we are glad that many other players have emerged to help build and grow such startups. As the old saying goes, it takes a village to raise a child. We note with appreciation that the government has shown a keen interest in collaborating with private sector partners to help raise the Philippine startup scene to global standards through the QBO Innovation Hub,” said Manuel V. Pangilinan, head of IdeaSpace, PLDT and First Pacific. “Our hope is that the hub will help spur the Philippine startup ecosystem and trigger the spirit of innovation, risk-taking and creativity that will give birth to new companies, new jobs and wealth for entrepreneurs, their partners and their employees. We aim to be as inclusive as possible and to collaborate with both local and international business groups and funders to produce game-changing breakthroughs to rival businesses around the world,” said Rene “Butch” Meily, who will be leading the QBO Innovation Hub. Katrina R. Chan of IdeaSpace will serve as Executive Director of QBO. Meily also heads the Philippine Disaster Resilience Foundation (PDRF), a private sector vehicle for disaster management that has become a role model for the UN’s Connecting Business Initiative and includes many of the country’s major corporations. Aside from DTI and IdeaSpace, the innovation hub was made possible with support from the Department of Science and Technology and JP Morgan Foundation. It takes its cue from the rise of innovation districts around the world – the likes of Silicon Valley in the United States, Block 71 in Singapore and Tel Aviv, the center of ‘Startup Nation’ in Israel. QBO Innovation Hub is a natural progression in the efforts of IdeaSpace to help promote startup technopreneurship in the country, aside from providing equity-free funding, incubation and acceleration through its national startup competition held annually since 2012. A non-profit foundation, IdeaSpace is supported by the following companies; First Pacific, Metro Pacific Investments Corporation, PLDT, Smart Communications, Meralco, Indofood, Philex Mining, Maynilad, MediaQuest and TV5. During the event, DTI also announced its plan of establishing a food innovation hub at the Philippine Trade Training Center later this year to strengthen its advocacy of advancing the innovation and entrepreneurship agenda. DTI noted that initiatives like this would support the realization of the Philippines’ ambition to be known as Asia’s trendsetter in export products and services. For the past six months, DTI had been active in tapping the private sector and the academe to further enhance the innovative capacity of Filipino entrepreneurs and to encourage more investors in the startup, innovation and creative services sector. Several events such as SlingShot Philippines carried out a series of dialogues to accelerate the development of the startup and innovation ecosystem in the country. Named after the iconic “kubo” as it reflects the modern re-imagination of the traditional Filipino home and community space and developed in partnership with the BBDO creative agency, DTI hopes that the QBO Innovation Hub will usher in a new breed of startups that will thrive in the innovation economy.